Whether you are a seasoned camper or beginning explorer, you will need rope. Believe it or not, you will actually need more rope than what you think. While the definition of rope is long, thick cord that consists of fibers that have been twisted or braided. These fibers can be made from such things as hemp and sisal. In modern times, manmade fibers are used such as nylon, polyester, and polypropylene. When it comes to paracord though, the best manmade fiber for this product is nylon, which is waterproof and mildew resistant. Another important characteristic of paracord is how it is made. As stated before, rope is made by twisting or braiding fibers. In paracord, the kernmatle process is followed. What this means is that you have a core fiber or kern by which a braided sheath goes around. The true strength of this type of rope comes from the “kern.” The braided sheath protects the “kern” from being cut through due to abrasion. 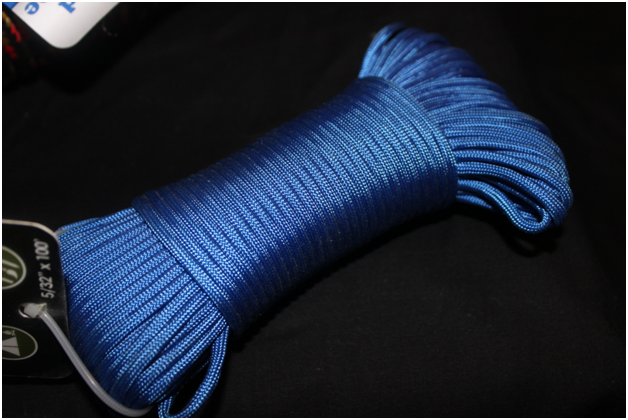 When shopping for paracord, you may notice that there is a grading system. The grading goes from I to IV. Each grade has a minimum and maximum weight by which this rope can support. The grade also indicates how many fibers were twisted to make the “kern” along with how many fibers were braided together to make the sheath. In general, the more fibers used to make the “kern” and sheath the stronger the paracord. But many diehard fans of paracord only consider the grade III or 550 paracord to be the real McCoy. Now that you know the low down on paracord, there is one caution. Do not assume that your paracord is 550 just because it says it is paracord. To get the grade III or 550, it must say so on the packaging. Ok, so you get the real stuff now what do you do? Paracord is a multi-purpose tool. It can be used as a shoe string, belt, clothesline, secure a tent, hang a bear bag, and even help make an emergency shelter. If you do not want to carry a big wad of paracord on or in your pack, consider buying a paracord bracelet. While I do carry some on my backpack, I also have a paracord bracelet that I made. The reason for the two supplies is the fact that it is so useful and there are times that I need some paracord and I do not have my pack. Having a bracelet of it makes it easy and accessible during those times.